Sister Michael Andrew, Ella Mae Hill, following a short stay at Saint Joseph Villa entered eternal life on March 17, 2019, while still missioned to St. Rose of Lima High School in Belmar, New Jersey, Her funeral followed at the Villa on March 21. Her seashore assignment was a treasure spot for her. Born to parents William and Ella, Ella Mae was a native of St. Patrick’s Parish in Philadelphia, a proud graduate of John W. Hallahan High School, and was received into the Congregation in 1952. Her educational credentials prepared her well for her many years as a teacher. 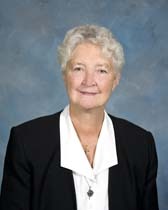 Sister Michael taught mainly at the high school level, with stints in Pennsylvania and New Jersey. She also held the position of local superior at one point. A last mission or assignment found her working in the library at St. Rose of Lima High School in Belmar, indeed fitting for this history buff and devotee of the seashore. Sister Michael was a good teacher, as testified by former students who kept in touch with her on Facebook. She was patient and kind in the classroom, and sisters with whom she lived noted her even-tempered and kind disposition, always ready with a welcoming spirit, to whatever or whomever came her way. Her great devotion to favorite saints inspired others. St. Joseph, St. Michael, St. Francis deSales and steady St. Anthony were among her “go to” saints. Sister Michael lived by example, and others learned from and became influenced by her example. Rest in Peace, Sister Michael!